Although the recipe calls for specific amounts and ingredients that go nicely together, the truth is it’s highly flexible, and you can easily omit, swap, or add your kids’ favorite fruits and ingredients. Or just put all the ingredients on the table to create a “pizza factory,” and let the kids assemble their own pizza—a wonderful way to get children excited about vibrantly healthy food. Watermelon Pizza will keep up to one day, covered and refrigerated. 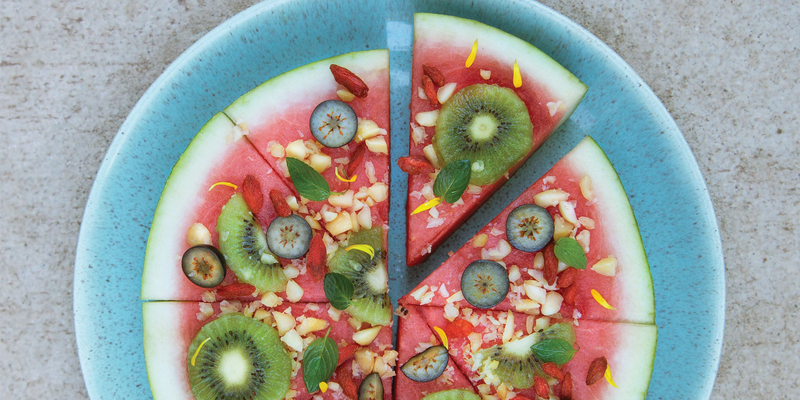 Variation: Although Watermelon Pizza is delicious and fun for adults as well as kids, you might want to try a few of the following ingredients, which are more grown-up-friendly, and make a great party snack: shaved fennel, minced parsley, black pepper, sea salt, and a drizzle of olive oil. You can also add superfood cheeses to the mix. They go surprisingly well with watermelon!